Between BBQs, home improvements, and light local yardsale activity, this has been a pretty low-key summer for video game scores. We hit one nearby sale advertising video games. They had a GBA with a few kiddie games. We passed, not even bothering to ask the price. While we haven't been hitting the sales as much as we'd like, we have made some good progress on our game room. The second round of floating shelf construction has been on hold for a few months, but in the meantime we've done some reorganizing, unpacking, and even purchased a few different bookcase units for various purposes. The coolest (but most expensive) is this unit by a company called Northfield. We bought four of these and placed them end-to-end along one of the walls. These are our console "museum" shelves. What's great about the various size cubbies is that they accommodate all of the various systems. We came across other units that just had cubes, which were too small for some of the larger consoles, and others that were just open. We wanted a unit with dividers of some sort to enhance the display. Plus, the alternating shelves look awesome next to each other. We also bought two basic black 3-shelf bookcases to house the systems we will actively be playing, and placed those on either side of the TV. 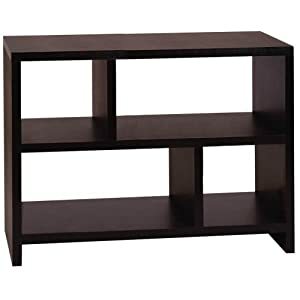 Finally, we bought two 6-shelf "media" bookcases that will hold various console carts (e.g. N64, Genesis, SNES, etc.). We'll get some pictures of the room up soon.